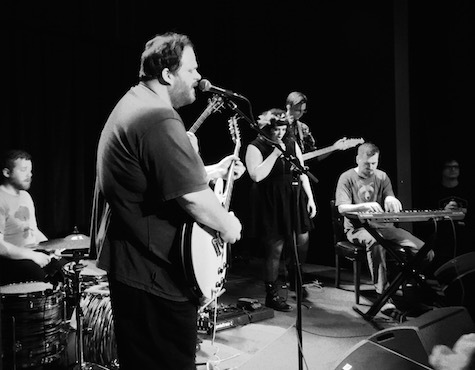 John Klemmensen and the Party at Reverb, May 1, 2015. What is the musical future of John Klemmensen? Who knows. It’s impossible to base anything on an album release party. Case in point: How many times have you seen bands pull off well-attended album release shows only to fall back to wherever they were before, never building on the momentum they’ve gained leading up to the show? It’s laughably commonplace. On the other hand, what are these artists supposed to do next? The simple answer is hit the road. Go on a self-booked tour that gets them to as many nearby cities and towns as possible; a tour that presumably was arranged months in advance of the album release show. But that rarely happens because, well, these artists have to survive. They have to feed themselves and their family. They have to pay their rent. Which means the following Monday it’s back to whatever day-job they suffer through to pay the bills. Booking a tour on your own is difficult. Going out on tour — especially with a band the size of The Party — is expensive. It’s a massive money-loser for everyone involved, an expensive vacation that doesn’t include good meals and hotels. Because of these reasons, local bands talk about touring, but rarely do. And time passes. Eventually the band plays another local show, and another. And slowly, in their spare time, they begin to write more songs and, before you know it, a Kickstarter campaign pops up and they begin gearing up for the next album release show. It’s an endless cycle. The only way to break out of it is for a miracle to happen, such as someone important (such as a record label) discovering your album who is willing to do what it takes to get you to the next level — rerelease, distribution, publicity, booking agent, financial backing necessary to hit the road. It’s like winning the lottery, and it never happens. That doesn’t stop people from dreaming. Part of that dream has happened for Klemmensen. Someone put up the money to press 500 copies of Party All Night, his new album. What that person is able to do next to get the record heard only Klemmensen knows, but to that person I say: You have made a good bet based on how the audience responded to his music Friday night — full-on sing-alongs and fist pumps. It helps that Klemmensen has been performing this music for months, but there also is that tangible quality — memorable, yell-worthy lyrics. I think Klemmensen could break through as a pop act. His music is suited for it. It’s certainly not indie, and when it comes to making a living playing music, that’s probably a good thing these days. But it all depends on what he does next. If he never gets a chance to go on the road, if he goes back to life-as-usual, the only thing that’ll come out of Friday night’s show is a sweet memory. 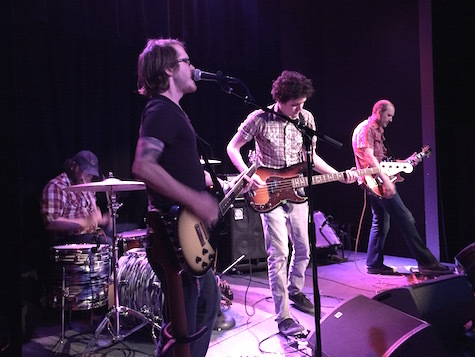 Little Brazil at Reverb Lounge, May 1, 2015. Opener Little Brazil put on the best show they’ve played in a long time. The set was all (or almost all) new material, and it was all somewhat awesome. I’m told they’ve recorded some demoes of these songs; can a full-length can’t be far off? Well, frontman Landon Hedges has his hands full over the coming months with the release of the new album by his other band, Desaparecidos, and the ongoing support tour. 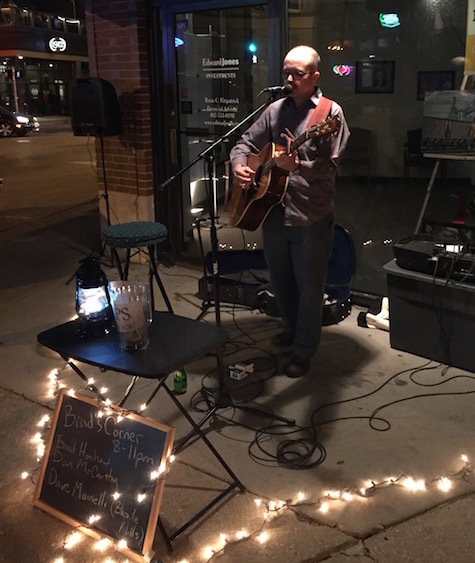 Dan McCarthy at Brad’s Corner during Benson First Friday, May 1, 2015. When did record labels start releasing albums on Mondays? Today Saddle Creek released the new Hop Along and Twinsmith records. Isn’t Tuesday release day (which is eventually shifting to Fridays at some point)? Painted Shut is being released on Saddle Creek, a label built on the kind of romantic, middle-American indie that made Hop Along possible in the first place—music more indebted to the 1970s than the 1980s, more to the earnest mythologizing of folk than the grandstanding of rock, more to the fantasias of Edward Gorey and e.e. cummings than to the flash of the city; music for rickety houses in college towns and the lonelyhearts who collect in their corners like dust and give each other stick-and-pokes. I’d say it all seems old-fashioned but it has been this way for about 25 years and seems part of a longer continuum all the time, so who knows. Just got word that the big concert announcement I mentioned online here last week is coming Wednesday morning. Huge. Watch Lazy-i or (I guess) the local media for the announcement. It’ll be hard to miss. Great Monday night show tonight: Lady Lamb, whose new album After was just released in March on Mom & Pop Music (Courtney Barnett’s new label) are playing at Slowdown Jr. with Rathborne and Jordan Smith. $12, 9 p.m.